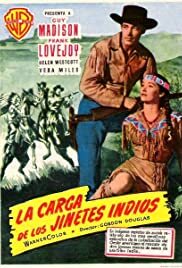 An army doctor, with no combat experience, is forced to take command of a cavalry troop escorting a wagon train through hostile Indian country when the unit's commanding officer dies. In 1878, Ward Kinsman, a prospector and Indian scout, has been persuaded by the US Cavalry to find Mary Carlyle, the daughter of a general, who has been taken by Apaches. Pvt. Wilhelm: Yeah; I'll just fill my pipe! I saw this movie in its original 3-D run in 1953 and never forgot it. Roughly based the actual Battle of Beecher's Island in Colorado, it's pretty exciting stuff. Some say that this is the movie that killed 3-D with Frank Lovejoy spitting into the face of the audience. I don't know about that, but I do know that I enjoyed it then and enjoyed it again recently on cable. And then, of course, this is THE movie with the Wilhelm Scream, made famous by latter day maestros such as George Lucas. No DVD version released yet...maybe in the not-too-distant future. The love story is sort of stupid and the comedy bits are not very funny, but I know I enjoyed it more than The English Patient, or just about anything that Merchant-Ivory ever released. I suppose the movie was produced to take advantage of Guy Madison's high visibility as TV's Wild Bill, very popular with the kiddies at the time.